We’ve only just started to understand how much poor sleep impacts on our mental and physical health. Does it affect horses in the same way? Early research is suggesting ‘yes’, and competition results, or even rider safety, could suffer as a result. We have known for some time that horses don’t choose to sleep in one long daily bout and they can sleep standing up, unlike humans. The phases of sleep have now been observed in the horse using brain-waves, similar to that used in a human sleep-lab. In the horse, Slow Wave Sleep (SWS) occurs while standing, laying down on the chest-bone (sternum), and laying completely flat. Rapid Eye Movement (REM) sleep, which is considered ‘deep sleep’, occurs during SWS. 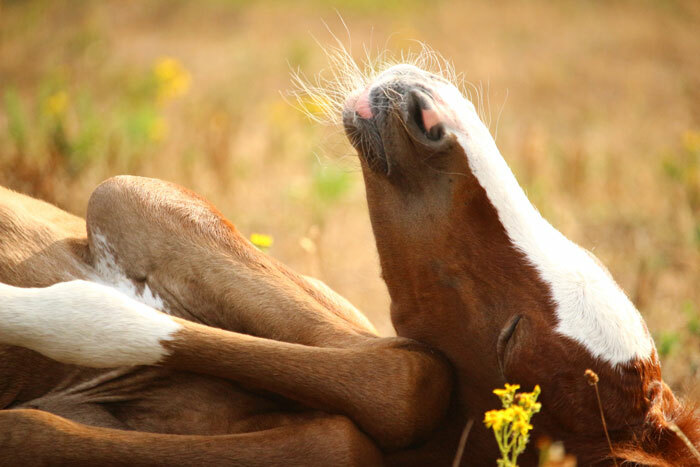 REM sleep can only happen in the horse when lying flat, because the muscles will relax completely. This should promote glycogen uptake in fatigued muscles – known to take twice as long in horses as humans. Also, REM sleep allows memory processing, and so the ability to learn. In support of these findings in horses, a study in show-jumping has found performance declined significantly (slower rounds with significantly more jumping faults), when horses spent less time the nights before in Slow Wave Sleep. This was for low-level competition, and the researchers hypothesize the effect may be even greater in high-level performance horses. Signs of sleep deprivation have been observed many times in horses and can be so worrying, they are often mistaken by owners for an incurable, abrupt collapse condition, called narcolepsy. Sleep deprived horses may enter REM while stood up – and part-buckle at the knees, or collapse. 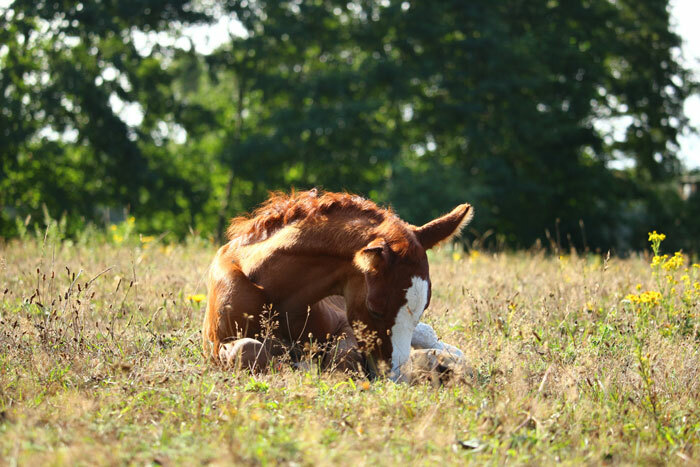 Other clinical signs of sleep deprivation may include grazes or calluses on the front of both knees or fetlocks (from falling), loss of appetite, reduction in other normal behaviors, compromised immunity, general lethargy and reduced responsiveness to stimuli. Why would horses stand to the point of collapse? Blood markers of stress have been found in sleep-deprived horses. Social anxiety, either through isolation or poorly chosen companions, reduces laying behavior. Many ‘standard’ stable installations are actually built to minimum recommendations, to save money, but can be inadequate for larger horses to feel confident they can stand up again. So, a lack of floor space or bedding area has a large influence on laying behavior. However, it is musculoskeletal and gastro-intestinal pain, while laying down and getting up again, that features most prominently in the literature and clinical case studies. Given a choice, even healthy horses prefer a clean, soft bed to lay on. It will soon be possible to monitor your own horse’s sleep patterns without resorting to CCTV, and more research is planned. Even so, we can currently point to preliminary evidence that sleep-deprived horses are likely to be: less healthy, less motivated, quicker to fatigue and slower to learn. Whether you’re riding a technical cross-country course, improving your dressage, or head-to-head in the final furlong, ensuring a good night’s sleep could give you the winning advantage. While this is a wake-up call for owners, maybe the horses would prefer to sleep on it!